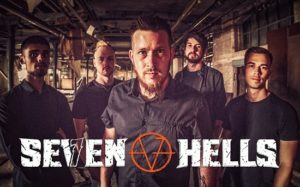 So, with the line up looking really solid for HRH Metal in Birmingham we catch up with another band set to blow the roof off this event, Leicester-based Seven Hells. This hard-hitting group are a testament to all that’s metal, with bone shattering riffs, which really get the blood flowing. I was eager to pin them down for a chat before experiencing their explosive set. The reaction has been really positive, we’ve had some great reviews and it has left fans wanting more which is perfect as they can expect a full-length album in 2019! With the new year ahead how do you go about organizing the bands calendar of events? Our main focus at the moment is booking as many shows as we can, we are a band that loves to play live and this is where we are at our best. We have been speaking to a lot of promoters and the calendar is steadily filling up for the year. You kicked off 2019 in style with your first gig at Trillians Rock Bar playing alongside Kilonova, Lords of Ruin and Dead River Kings. How did this go? It was actually our first time playing in Newcastle, so we didn’t know what to expect. It was a great experience though with a packed out Trillians bar, a killer line-up of bands and an awesome reaction from the crowd. We all stopped over with plans of a big night out in Newcastle after but ended up in bed not long after the gig… we are returning later in the year so maybe we should pace ourselves next time. Sounds like a good idea! Nothing wrong with being in bed early though! Next up, you’re hitting the explosive HRH Metal in Birmingham, how did come about? Did you have to apply or did you get asked to play? Shortly after winning the Leicester M2TM we were contacted asking if we wanted to play. It came as a surprise but of course we quickly said yes, having attended the festival previously it’s really cool to be given the opportunity to be a part of it. Being approached to play the festival is a good sign for the band that your heading in the right direction! How do you find festivals such as this impact upon bands, and what would you say is one defining characteristic that sets HRH events apart from other festivals? It gives bands some really valuable experience in playing a professionally run festival alongside some big bands which helps take newer bands to the next level. I think the thing that sets HRH apart is it has the big festival feel to it but in a smaller venue which is great as you can see a variety of bands without the long walks between stages. Absolutely! That’s what I love about the HRH events personally – all indoors and no long walks. With HRH covering all the bases genre wise with individual events, do you find this allows bands more chances of exposure being able to play to select audiences? It certainly does, we know that the crowd at HRH Metal are going to love their metal and hopefully walk away after as new fans of Seven Hells. Seven who… Im joking! (laughs) With larger festivals such as Download who lean towards more mainstream bands, do you find that the HRH events are a good platform for new up and coming bands to be seen? HRH events give people attending the festival the chance to discover bands they might not have heard of otherwise, this helps non-mainstream bands to grow organically without the push of a label that mainstream bands tend to have. When the day of the festival finally arrives do you find yourself more adrenaline filled, how do you go about getting yourself in the zone to play in front of the crowds? There are always a few pre-gig nerves but the adrenaline kicks in and you are good to go. We usually have a few drinks and have a quick warm up so nothing too crazy to get in the zone. One strange thing our vocalist does before each show is look in the mirror and repeatedly tell himself he is the prettiest of them all……..must be a front man confidence thing! So, I guess Cinders will be at the ball after all… damn wrong story! Will there be any surprises attendees can expect at HRH Metal? We have been writing heavily for our debut album which fans can expect later this year, with a lot of new material we hope to be playing some live at HRH. 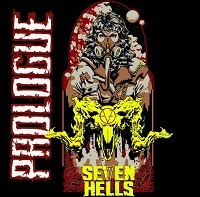 So, if anyone has seen us before make sure you come and see us again for a preview of the next chapter of Seven Hells. What would you say have been the biggest challenges for the band so far? Vocalist Marc’s biggest challenge has been accepting the fact that it’s 2019 and wearing a snood on stage just isn’t cool anymore. Guitarist Dan’s biggest challenge was to avoid a restraining order when we bumped into one of the Parkway Drive guitarists at Download and Dan asked him a “few” questions about his amp settings… and by few we mean a lot. Guitarist Simon’s biggest challenge has been dealing with the break-up of One Direction. Bassist Ollie’s biggest challenge has been learning the names of the four strings on his bass. Drummer Kris’ biggest challenge has been balancing his drumming/band life alongside his other main passion – interpretive dance. Have you had any bad experiences at events you have played that you can tell us about? As a relatively new band we haven’t yet. Luckily, over the past year or so, everything has ran smoothly. What has the band got lined up for the rest of the year? We will be announcing quite a few shows that we have booked soon and looking to add to this as the year goes on, also we will be releasing our debut full length album later this year which we are really excited for. We have really stepped it up and the album is sure to turn a few heads! HRH Metal takes place at the O2 Academy in Birmingham on 16/17 January.